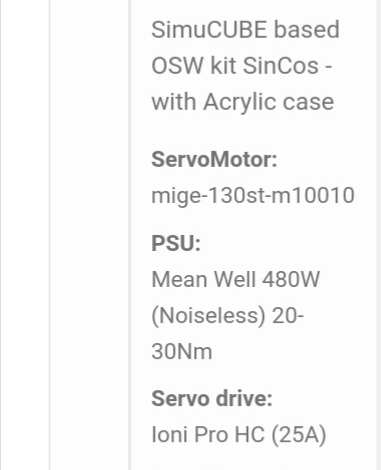 hello, i am using osw direct drive that had an old version of simucube and after a few days ago I updated to most recent version 11.2 and now i have a problem with steering engine overvoltage. simucube setup is the same, tried on the different games like asseto corsa, live for speed, RBR and its still the same, engine disconnects power when turning harder. can someone help to fix this problem? Enter granity , set FOC at max setting and tell me what FOV do you use atm . you are using small mige with 48v psu ? Please give screenshots of the settings in Granity. Also, you can manually update to IONI firmware 1.7.9 which as an additional fix to overvoltage faults. It will be included and automatically updated for normal Simucube users as well. when you updated the ioni firmware , did you check if the “reset device parameters to factory state” was ticked ? if it was that means that you updated the firmware but you cleared all the settings for your motor so it won’t work. Can you post some photos of what the machine tab in granity looks like atm ? at this moment i cant send photos, but yea, it was ticked, so what i need to do next? You need to reload the drc for your setup , or start putting every option manually if you know them. If you have the drc it is rather easy. If you don’t and you don’t know what to do , just tell me what psu , servo and encoder you are using and i ll provide one for you. Ofcourse if your setup came prebuilt from a vendor you could ask them for the settings drc. Either way i can help you if needed. You need to be more specific. Were did you buy it from? 130st is m10010 and m15015 . 2 different servos so the settings differ. Also you need to know with what encoder was it fitted and what psu. Give a little more details. If you have a receipt those things will most likely show up in there. you open granity , connect , load settings from this file and save them to drive , and ofc you then disable granity in simucube to start the wheel . And there was no reason to manually update the IONI firmware, and even less reason to clear the settings while doing so. Most likely those faults happening were not caused by IONI firmware, rather than some servo drive settings being on the limit. But you should be good to go with the settings file Loukas gave you, and lets from there. if it doesn’t work instantly it will be more likely because i set mcc to close to mmc. If that happens just lower mcc to 9.500 . But it is possible that it will work out of the box. I am glad it worked out ok.
Report back if you have overvlotage faults. I have set your servo about 15.55nM . If you need help with any settings for a specific game ask here or better in the topic for the game that you play but tell them that you have the small mige with 10amps. changed the mcc , it will work better this way , so feel free to try it. Problems with my computer crashing in both iRacing and Asetto - can you help!